Copyright: © 2017 Romano R, et al. This is an open access article distributed under the Creative Commons Attribution License, which permits unrestricted use, distribution, and reproduction in any medium, provided the original work is properly cited. Transglutaminases are a family of Ca2+-dependent enzymes which catalyze post-translational modifications of proteins. The main activity of these enzymes is the cross-linking of glutaminyl residues of a protein/peptide substrate to lysyl residues of a protein/peptide co-substrate. In addition to lysyl residues, other second nucleophilic co-substrates may include monoamines or polyamines (to form mono-or bi-substituted/crosslinked adducts) or -OH groups (to form ester linkages). In absence of co-substrates, the nucleophile may be water, resulting in the net deamidation of the glutaminyl residue. Transglutaminase activity has been suggested to be involved in molecular mechanisms responsible for both physiological and pathological processes. In particular, transglutaminase activity has been shown to be responsible for human autoimmune diseases, and Celiac Disease is just one of them. Interestingly, neurodegenerative diseases, such as Alzheimer’s disease, Parkinson’s disease, supranuclear palsy, Huntington’s disease and other polyglutamine diseases, are characterized in part by aberrant cerebral transglutaminase activity and by increased cross-linked proteins in affected brains. Here we describe the possible molecular mechanisms by which these enzymes could be responsible for such diseases and the possible use of transglutaminase inhibitors for patients with diseases characterized by aberrant transglutaminase activity. Transglutaminases (TGs, E.C.2.3.2.13) are Ca2+-dependent enzymes which catalyze post-translational modifications of proteins. Examples of TG-catalyzed reactions include: (I) acyl transfer between the γ-carboxamide group of a protein/polypeptide glutaminyl residue and the ε-amino group of a protein/polypeptide lysyl residue; (II) attachment of a polyamine to the γ-carboxamide of a glutaminyl residue; (III) deamidation of the γ-carboxamide group of a protein/polypeptide glutaminyl residue (Figure 1) [1,2]. The reactions catalyzed by TGs occur by a two-step mechanism (ping-pong type), (Figure 2). The transamidating activity of TGs is activated by the binding of Ca2+, which exposes an active-site cysteine residue. This cysteine residue reacts with the γ-carboxamide group of an incoming glutaminyl residue of a protein/peptide substrate to yield a thioacyl-enzyme intermediate and ammonia, (Figure 2, Step 1). The thioacyl-enzyme intermediate then reacts with a nucleophilic primary amine substrate, resulting in the covalent attachment of the amine-containing donor to the substrate glutaminyl acceptor and regeneration of the cysteinyl residue at the active site, (Figure 2, Step 2). If the primary amine is donated by the ε-amino group of a lysyl residue in a protein/polypeptide, a Nε-(γ-L-glutamyl)-L-lysine (GGEL) isopeptide bond is formed, (Figure 1A, example I). On the other hand, if a polyamine or another primary amine (e.g. histamine, serotonin and others) acts as the amine donor, a γ-glutamylpolyamine (or γ-glutamylamine) residue is formed, (Figure 1, example II). It is also possible for a polyamine to act as an N,N-bis-(γ-L-glutamyl)polyamine bridge between two glutaminyl acceptor residues either on the same protein/polypeptide or between two proteins/polypeptides . If there is no primary amine present, water may act as the attacking nucleophile, resulting in the deamidation of glutaminyl residues to glutamyl residues, (Figure 1, example III). Regarding the physiological roles played by the transglutaminase activity, recently transglutaminase-catalyzed polyamination of tubulin has been shown to stabilize axonal microtubules, suggesting an important role for these reactions also during some physiological processes, such as neurite outgrowth and axon maturation . The reactions catalyzed by TGs occur with little change in free energy and hence should theoretically be reversible. However, under physiological conditions the cross linking reactions catalyzed by TGs are usually irreversible. This irreversibility partly results from the metabolic removal of ammonia from the system and from thermodynamic considerations resulting from altered protein conformation. Some scientific reports suggest that TGs may be able to catalyze the hydrolysis of Nε-(γ-L-glutamyl)-L-lysine cross-links (GGEL) isopeptide bonds in some soluble cross-linked proteins. Furthermore, it is likely that TGs can catalyze the exchange of polyamines onto proteins . In TG2 other catalytic activities, such as the ability to hydrolyze GTP (or ATP) into GDP (or ADP) and inorganic phosphate (Figure 1, example IV), a protein disulfide isomerase activity (Figure 1, example V), and a kinase activity which phosphorylates histones, retinoblastoma (RB) and P53 (Figure 1, example VI), are present, while only some of these activities have been identified also in other TGs [5-8]. 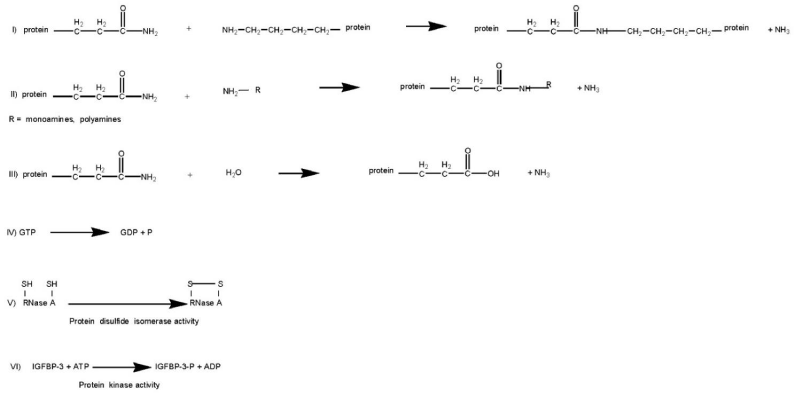 Figure 1: Examples of reactions catalyzed by TG: (I) acyl transfer between the γ-carboxamide group of a protein/polypeptide glutaminyl residue and the ε-amino group of a protein/polypeptide lysyl residue; (II) attachment of a polyamine to the γ-carboxamide of a glutaminyl residue; (III) deamidation of the γ-carboxamide group of a protein/polypeptide glutaminyl residue; (IV) GTPase activity; (V) protein disulfide isomerase activity; (VI) protein kinase activity. Figure 2: Schematic representation of a two-step transglutaminase reaction. Step 1: In the presence of Ca2+, the active-site cysteine residue reacts with the γ-carboxamide group of an incoming glutaminyl residue of a protein/peptide substrate to yield a thioacyl-enzyme intermediate and ammonia. Step 2: The thioacyl-enzyme intermediate reacts with a nucleophilic primary amine substrate, resulting in the covalent attachment of the amine-containing donor to the substrate glutaminyl acceptor and regeneration of the cysteinyl residue at the active site. If the primary amine is donated by the ε-amino group of a lysyl residue in a protein/polypeptide, a Nε-(γ-L-glutamyl)-L-lysine (GGEL) isopeptide bond is formed. Ample experimental evidence indicate that some TGs are multifunctional proteins with distinct and regulated enzymatic activities. In fact, under physiological conditions, the transamidation activity of TGs is latent [9,10], while other activities, recently identified, could be present. For example, in some physiological states, when the concentration of Ca2+ increases, the crosslinking activity of TGs may contribute to important biological processes. As previously described, one of the most intriguing properties of some TGs, such as TG2, is the ability to bind and hydrolyze GTP and furthermore, to bind to GTP and Ca2+. GTP and Ca2+ regulate its enzymatic activities, including protein cross-linking, in a reciprocal manner: the binding of Ca2+ inhibits GTP-binding and GTP-binding inhibits the transglutaminase cross-linking activity of the TG2 . Interestingly, TG2 shows no sequence homology with heterotrimeric or low-molecular-weight G-proteins, but there is evidence that TG2 (TG2/Ghα) is involved in signal transduction, and, therefore, TG2/Ghα should also be classified as a large molecular weight G-protein. Other studies, along with ours, showed that TG2/Ghα can mediate the activation of phospholipase C (PLC) by the α1b-adrenergic receptor  and can modulate adenylyl cyclase activity . TG2/Ghα can also mediate the activation of the δ1 isoform of PLC and of maxi-K channels . Interestingly, the signaling function of TG2/Ghα is preserved even with the mutagenic inactivation of its crosslinking activity by the mutation of the active site cysteine residue . To date at least eight different TGs, distributed in the human body, have been identified (Table 1) [14-19]. Complex gene expression mechanisms regulate the physiological roles that these enzymes play in both the intracellular and extracellular compartments. In the Nervous System, for example, several forms of TGs are simultaneously expressed [20-22]. Moreover, in these last years, several alternative splice variants of TGs, mostly in the 3’-end region, have been identified . Interestingly, some of them are differently expressed in human pathologies, such as Alzheimer’s disease (AD) . On the basis of their ubiquitous expression and their biological roles, we may speculate that the absence of these enzymes would be lethal. However, this does not always seem to be the case, since, for example, null mutants of the TG2 are usually phenotypically normal at birth [12,25,26]. This result may be explained by the expression of other TG genes that may substitute the TG2 missing isoform, although other TG isoform mutations have been associated with severe phenotypes, such as lamellar ichthyosis for TG1 isoform mutations. Bioinformatic studies have shown that the primary structures of human TGs share some identities in only few regions, such as the active site and the calcium binding regions. However, high sequence conservation and, therefore, a high degree of preservation of secondary structure among TG2, TG3 and FXIIIa indicate that these TGs all share four-domain tertiary structures which could be similar to those of other TGs . Table 1: TGs and their physiological roles when known. Although numerous scientific reports suggest that the transglutaminase activity is involved in the pathogenesis of neurodegenerative diseases, to date, however, still controversial experimental findings about the role of the TGs enzymes in these diseases have been obtained [28-30]. Protein aggregates in affected brain regions are histopathological hallmarks of many neurodegenerative diseases . More than 20 years ago Selkoe et al. , suggested that TG activity might contribute to the formation of protein aggregates in AD brain. In support of this hypothesis, tau protein has been shown to be an excellent in vitro substrate of TGs [33,34] and GGEL cross-links have been found in the neurofibrillary tangles and paired helical filaments of AD brains . Interestingly, a recent work showed the presence of bis γ-glutamyl putrescine in human CSF, which was increased in Huntington’s disease (HD) CSF . This is an important evidence that protein/peptides crosslinking by polyamines does indeed occur in the brain, and that this is increased in HD brain. TG activity has been shown to induce also amyloid β-protein oligomerization  and aggregation at physiologic levels . 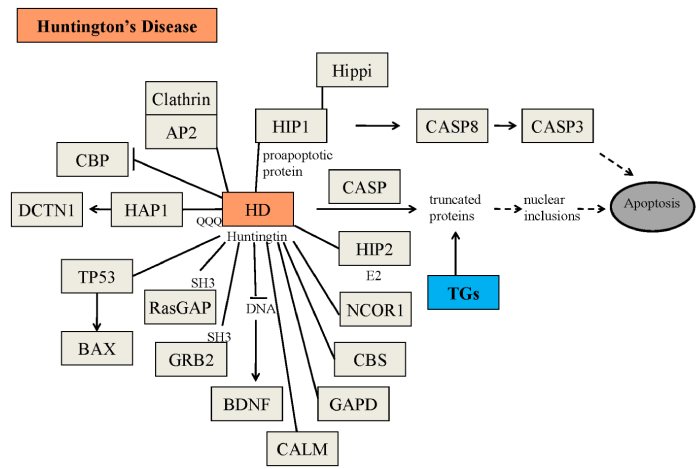 By these molecular mechanisms, TGs could contribute to AD symptoms and progression . Moreover, there is evidence that TGs also contribute to the formation of proteinaceous deposits in Parkinson’s disease (PD) [39,40], in supranuclear palsy [41,42] and in HD, a neurodegenerative disease caused by a CAG expansion in the affected gene . For example, expanded polyglutamine domains have been reported to be substrates of TG2 [44-46] and therefore aberrant TG activity could contribute to CAG-expansion diseases, including HD (Figure 3). However, although all these studies suggest the possible involvement of the TGs in the formation of deposits of protein aggregates in neurodegenerative diseases, they do not indicate whether aberrant TG activity per se directly determines the disease progression. For example, several experimental findings reported that TG2 activity in vitro leads to the formation of soluble aggregates of α-synuclein  or polyQ proteins [48,49]. To date, as previously reported, at least ten human CAG-expansion diseases have been described (Table 2) [50-59] and in at least eight of them their neuropathology is caused by the expansion in the number of residues in the polyglutamine domain to a value beyond [35-40]. Remarkably, the mutated proteins have no obvious similarities except for the expanded polyglutamine domain. In fact, in all cases except SCA 12, the mutation occurs in the coding region of the gene. However, in SCA12, the CAG triplet expansion occurs in the untranslated region at the 5’ end of the PPP2R2B gene. It has been proposed that the toxicity results from overexpression of the brain specific regulatory subunit of protein phosphatase PP2A . Most of the mutated proteins are widely expressed both within the brain and elsewhere in the body. A major challenge then is to understand why the brain is primarily affected and why different regions within the brain are affected in the different CAG-expansion diseases, i.e., what accounts for the neurotoxic gain of function of each protein and for a selective vulnerability of each cell type. Possibly, the selective vulnerability  may be explained in part by the susceptibility of the expanded polyglutamine domains in the various CAG-expansion diseases to act as cosubstrates for a brain TG (Figure 4). To strengthen the possible central role of the TGs in neurodegenerative diseases, a study by Hadjivassiliou et al. , showed that anti-TG2 IgA antibodies are present in the gut and brain of patients with gluten ataxia, a non-genetic sporadic cerebellar ataxia, but not in ataxia control patients. Recently, anti-TG2, -TG3 and -TG6 antibodies have been found in sera from CD patients, suggesting a possible involvement also of other TGs in the pathogenesis of dermatitis herpetiformis and gluten ataxia, two frequent extra intestinal manifestations of gluten sensitivity [62,63]. These last findings could suggest also a possible role of the “gut-brain axe” for the etiopathogenesis of human neurodegenerative diseases, in which the TG enzymes, in particular the TG2 enzyme, could play an important role [64-66]. Table 2: List of polyglutamine (CAG-expansion) diseases. Figure 3: Possible physiopathological effects of the mutated huntingtin. Some of the physiopathological roles of mutated huntingtin, including the formation of nuclear inclusions, have been described in the Figure AP2=adipocyte Protein 2; BAX=bcl-2-like protein 4; BDNF=brain-derived neurotrophic factor; CALM= calmodulin; CASP=caspases; CASP3=caspase 3; CASP8=caspase 8; CBP= CREB binding protein; CBS = cystathionine-β-synthase; DCTN1 = dynactin subunit 1; GAPD=glyceraldehyde-3-phosphate dehydrogenase; GRB2=growth factor receptor-bound protein 2; HAP1=huntingtin associated protein 1; HIP1=huntingtin interacting protein 1; HIP2=huntingtin interacting protein 2; Hippi; HIP1 protein interactor; NCOR1=nuclear receptor corepressor 1; RasGAP=p21Ras protein and GTPase-activating protein complex; TGs=transglutaminases; TP53=tumor protein 53. 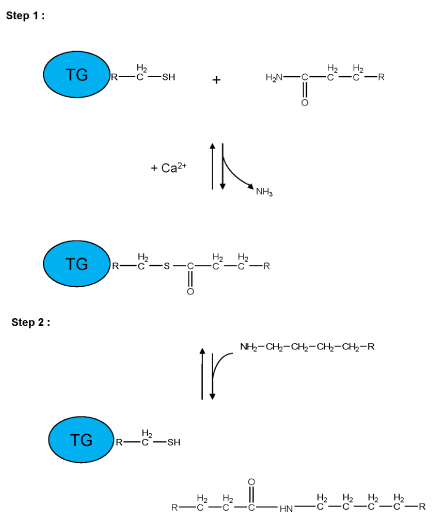 Figure 4: Possible mechanisms responsible for protein aggregate formation catalyzed by TGs. Transglutaminase activity could produce insoluble aggregates both by the formation of Nε-(γ-L-glutamyl)-L-lysine (GGEL) isopeptide bonds (left side of the figure) and by the formation of N,N-bis-(γ-L-glutamyl)polyamine bridges (right side of the figure) in the mutated huntingtin. 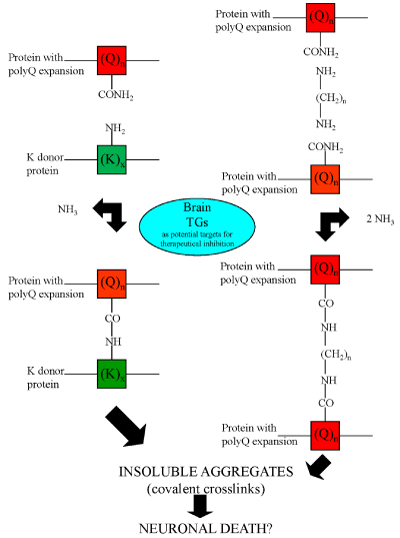 In support of the hypothesis of the toxic effect of TG activity in other neurodegenerative diseases, such as Alzheimer’s disease and Parkinson’s disease, TG activity has been shown to induce amyloid beta-protein and α-synuclein oligomerization and aggregation at physiologic levels [67-69]. In fact, TG activity induces protofibril-like amyloid beta-protein assemblies that are protease-resistant and inhibit long-term potentiation . Therefore, by these molecular mechanisms, TG activity could also contribute to Alzheimer’s disease symptoms and progression. Very recently, TG2 and its product isopeptide have been found increased in Alzheimer’s disease and APPswe/PS1dE9 double transgenic mice brains , while catalytically active TG2 colocalizes with Aβ pathology in Alzheimer’s disease mouse models . Interestingly, other works are suggesting that also other TGs could be involved in the molecular mechanisms responsible for neurodegenerative diseases . In particular, a recent work by Basso et al. , found that in addition to TG2, TG1 gene expression level is significantly induced following stroke in vivo or due to oxidative stress in vitro. Moreover, structurally diverse inhibitors, used at concentrations that inhibit TG1 and TG2 simultaneously, are neuroprotective. Together, these last studies suggested that multiple TG isoforms, not only TG2, participate in oxidative stress-induced cell death signalling, and that isoform nonselective inhibitors of TG will be most efficacious in combating oxidative death in neurological disorders. These are interesting and worthwhile studies, suggesting that multiple TG isoforms can participate in neuronal death processes. Therefore, all these studies suggest that the involvement of brain TGs could represent a common denominator in several neurological diseases, which can lead to the determination of pathophysiological consequences through different molecular mechanisms. Neuroinflammation plays an important role in various chronic neurodegenerative diseases, characterized also by the pathological accumulation of specific protein aggregates. In particular, several of these proteins have been shown to be substrates of transglutaminases. Interestingly, it has recently been demonstrated that transglutaminase 2 (TG2) may also be involved in molecular mechanisms underlying inflammation. In the central nervous system, astrocytes and microglia are the cell types mainly involved in this inflammatory process. The transcription factor NF-κB is considered the main regulator of inflammation and it is activated by a variety of stimuli including calcium influx, oxidative stress and inflammatory cytokines. Recently, in addition to these stimuli, TG2 has been shown to activate NF-κB both via a canonical pathway  and via a non-canonical pathway . On the other hand, NF-κB regulatory response elements are present also in the Transglutaminase 2 promoter . Under these conditions, the over-expression of TG2 results in the sustained activation of NF-κB. Several findings emphasize the possible role of the TG2/NF-κB activation pathway in neurodegenerative diseases, including Alzheimer’s disease, Parkinson’s disease, multiple sclerosis and amyotrophic lateral sclerosis. Together, these evidences suggest that TG2 could play a role in neuroinflammation and could contribute to the production of compounds that are potentially deleterious to neuronal cells . In consideration to the fact that up to now there have been no long-term effective treatments for the human neurodegenerative diseases previously reported, then the possibility that selective TG inhibitors may be of clinical benefit has been seriously considered. In this respect, some encouraging results have been obtained with TG inhibitors in preliminary studies with different biological models of CAG-expansion diseases. For example, cystamine (Figure 5) is a potent in vitro inhibitor of enzymes that require an unmodified cysteine at the active site . Inasmuch as TGs contain a crucial active-site cysteine, cystamine has the potential to inhibit these enzymes by a sulfide-disulfide interchange reaction. A sulfide-disulfide interchange reaction results in the formation of cysteamine and a cysteamine-cysteine mixed disulfide residue at the active site. Recent studies have shown that cystamine decreases the number of protein inclusions in transfected cells expressing the atrophin (DRPLA) protein containing a pathological-length polyglutamine domain . In other studies, cystamine administration to HD-transgenic mice resulted in an increase in life expectancy and amelioration of neurological symptoms [80,81]. Neuronal inclusions were decreased in one of these studies . Although all these scientific reports seem to support the hypothesis of a direct role of transglutaminase activity in the pathogenesis of the polyglutamine diseases, cystamine is also found to act in the HD-transgenic mice by mechanisms other than the inhibition of TGs, such as the inhibition of caspases , suggesting that this compound can have an additive effect in the therapy of HD. Currently, cysteamine is already in phase I studies in humans with HD , but several side effects, such as nausea, motor impairment and dosing schedule have been reported as reasons for non-adherence during phase II studies in human patients affected by cystinosis [84,85]. Another critical problem in the use of TG inhibitors in treating neurological diseases relates to the fact that, as previously reported, the human brain contains at least four TGs, including TG1,2,3  and TG6 , and a strong non-selective inhibitor of TGs might also inhibit plasma Factor XIIIa, causing a bleeding disorder. Therefore, from a number of standpoints it would seem that a selective inhibitor, which discriminates between TGs, would be preferable to an indiscriminate TG inhibitor. In fact, although most of the TG activity in mouse brain, at least as assessed by an assay that measures the incorporation of radioactive putrescine (amine donor) into N,N-dimethyl casein (amine acceptor), seems to be due to TG2 , no conclusive data have been obtained by TG2 gene knock-out experiments about the involvement of this TG in the development of the symptoms in HD-transgenic mice [26,88,89]. Moreover, a recent scientific report showed that cystamine reduces aggregate formation in a mouse model of oculopharyngeal muscular dystrophy (OMPD), in which also the TG2 knockdown is capable of suppressing the aggregation and the toxicity of the mutant protein PABPN1 , suggesting this compound as a possible therapeutic for OMPD. Figure 5: Chemical structure of cystamine. Numerous scientific reports have implicated aberrant TG activity in neurodegenerative diseases, but still today we are looking for experimental findings which could definitely confirm the direct involvement of TGs in the pathogenetic mechanisms responsible for these diseases. However, as result of the putative role of specific TG isoforms, such as TG2, in some human diseases, there is a considerable interest in developing inhibitors of these enzymes. Of those currently available, cystamine is the most commonly used experimentally to inhibit TG2 activity. In addition to cystamine, several types of TG2 inhibitors have been developed up to now . Interestingly, some of these inhibitors have shown promising results in experimental diabetic models . Therefore, the use of these inhibitors of TGs could be then useful also for other clinical approaches. To minimize the possible side effects, however, more selective inhibitors of the TGs should be required in the future. Progress in this area of research could be achieved, if possible, also through pharmaco-genetic approaches. This work is supported by the Italian Education Department and the Regione Campania (L.R. n.5 del 28.03.2002, finanziamento 2008) entitled: Identificazione e caratterizzazione di geni della transglutaminasi nel Sistema Nervoso in relazione allo sviluppo di malattie neurodegenerative (Identification and characterization of transglutaminase genes in the Nervous System in relationship to the development of neurodegenerative diseases). Gentile V, Grant F, Porta R.. Human prostate transglutaminase is localized on chromosome 3p21.33-p22 by in situ fluorescence hybridization. Genomics. 1995; 27: 219-220. Adams RD, Victor M. Principles of Neurology. McGraw-Hill, Inc. Ed. 1993. Lerner A, Matthias T. GUT-the Trojan horse in remote organs’ autoimmunity. J Clin Cell Immunol. 2016; 7: 401. Lerner A, Neidhofer S, Matthias T. Transglutaminase 2 and anti-transglutaminase 2 autoantibodies in celiac disease and beyond: Part A: TG2 double-edged sword: gut and extraintestinal involvement. Immunome Res. 2015; 11: 101-105.